VILNIUS – After Eugenijus Gentvilas, leader of the opposition Liberal Movement, voiced his plans to initiate the unification of liberal forces after the upcoming municipal election, Arturas Zuokas, leader of the Lithuanian Freedom Union (liberals), says he views such an invitation positively. Meanwhile, MP Ausrine Armonaite, former member of the Liberal Movement, says she doesn't look back amid plans to establish a new party. "We, the Lithuanian Freedom Union (liberals), have issued a statement to liberal forces over the possibility to unite, regain the historic name and resolve the unnecessary split of liberal forces. We are open to discussion and have always been, despite Gentvilas' prior negative opinion. I am glad it has changed and there's definitely room for discussion," Zuokas told BNS Lithuania on Friday. 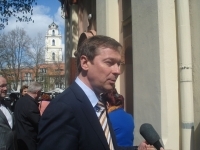 The former Vilnius mayor also said he would be open to talks with incumbent Vilnius Mayor Remigijus Simasius' team, despite their tough opposition. Meanwhile, Armonaite, is establishing a new political force with Simasius and says Gentvilas' latest statement shows "the Liberal Movement's ratings are rolling down." "We, on the other hand, are establishing a political force which will bring openness, optimism and diversity to the Lithuanian political system. We are united like-minded people across the whole of Lithuania, and I'm personally organizing meetings in various places in Lithuania, and will hold the first major meeting of our community on February 16. We are looking forward, not back," Armonaite told BNS Lithuania. Gentvilas told the Ziniu Radijas news radio earlier on Friday he plans to initiate the unification of liberal forces after the upcoming municipal election. "I believe we remain a liberal force in the political area, and after the municipal election we will initiate the unification of liberal forces. I'm also speaking about (former Vilnius Mayor Arturas – BNS Lithuania) Zuokas party, and also about the initiatives of (MP – BNS Lithuania) Ausrine Armonaite and (Vilnius Mayor – BNS Lithuania) Remigijus Simasius, which have not been very successful yet. I have no intention to mock anyone, quite contrary, I'm thinking about the possibility to cooperate with them in one or another way, we don’t want to burn bridges," Gentvilas said. Lithuania will hold municipal and direct mayoral elections on March 3.